The project „Start to Move“ has three levels: On the first one there is a completed sample of solution the aim of which is to help a pupil to understand a problem and a way how to solve it. 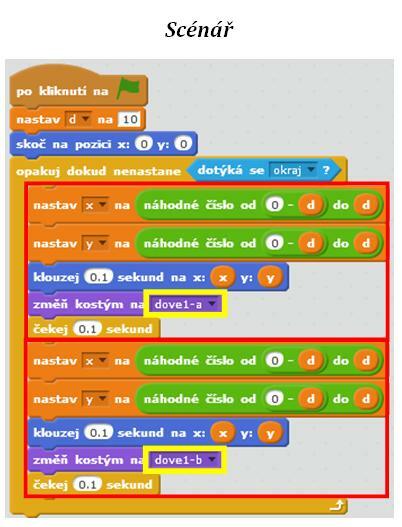 On the second level, there is non-solved assigment the aim of which is to give a pupil an opportunity to master and to improve his/her new skill to program a simple task. The third level anable to pupils to discuss about the problem using a social network Edmodo. The project „Start to move!“ was designed for pupils with the aim to support a self-paced approach to learning and to give pupils an opportunity to decide when they will solve the problem. Teachers can design more complex and difficult assigments for talanted pupils – for example, an optimization of movement to give the impression to look naturally (timing, positioning). Pupils have all needed information to be able to work not only at school, but also out of school, then go back to school with a solution and discuss about the solution (flipped classroom). At the same time he/she can communicate with his/her schoolmates, teachers, parents out of teaching class through Edmodo and to get a feedback and comments to his/her solution.Teachers can prepare also an questionnare to get data for their reflection and self-reflection.